Z-CUT2 and Z-CUT7 are automatic tape dispensers used for increasing the manufacturing plant's productivity. 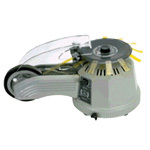 It is ideal for repetitive industrial taping applications. Z-CUT is designed to increase operator productivity, reduce material costs, dispense tape to consistent lengths, reduce operator fatigue, accept any type of tape, and provide straight cuts for better looking taped products and packages.